Healthy Mexican? Yes. It is so easy to make Mexican food healthy! Just skip the cheese and go for the incredible fresh flavors of cilantro, lime, poblanos peppers, and such. 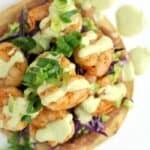 This easy Shrimp Chalupa dinner recipe does all that and more with succulent shrimp and a light and creamy sauce made with roasted poblano peppers. There is just so much in this recipe to love. So these are happening folks. Chalupas. Creamy sauce. Awesome ingredients. Flavor flavor flavor. And it is all wholesome. Mexican dishes like this are like the easiest to do this to, because with such great flavor …which Mexican foods totally have, the grease and grime are just not needed. So what I did here is pretty straight forward. Roast peppers. Make sauce. Make guac. Cook shrimp. Then assemble. Completely easy, and all the components can be made in advance. What I love about this recipe is the way the flavors come together and be sooooo so good. And the layers of textures – crunchy, creamy, crunchy, shrimp, and more creamy crunchy. Fun food yayyy – just be sure to have napkins ready and eat over a plate because chalupas are like that. But they still have to happen. And the sauce! Good glory the sauce. This Roast Poblano Sauce is completely reminiscent of what you get in restaurants, but with like a teensy fraction of the calories. Creamy and flavorful – because poblano peppers are so tasty – with a definite kick (and if you are shy about the kick, just use 1 pepper then 😇). But, this sauce is everything to this dish. A healthy recipe with succulent shrimp, cilantro, lime, poblanos peppers, and creamy sauce made with roasted poblano peppers. Heat the oven broiler. Roast the poblano peppers, 4-5 minutes per side, until skin is all blistered and peppers are soft. Transfer to a ziploc bag and let them steam. Once cool enough to handle, peel and remove seeds. Blend the peppers with the sour cream, buttermilk, and a pinch of salt and pepper. Set aside. Once the Guacamole is prepared, stir in the red onion. Cover with plastic wrap, directly on the guac to prevent browning, and set aside. In a bowl, season the shrimp well with Old Bay, salt, pepper, chili powder, and smoked paprika (~1/4 tsp each with a bit more Old Bay and chili powder). Heat a large, nonstick skillet on high heat. Add the olive oil and shrimp and cook, tossing occasionally, until shrimp are just cooked through (~3 minutes). Remove from the heat. To assemble the chalupa, spread a layer of refried beans on a chalupa shell, then a layer of Guacamole. 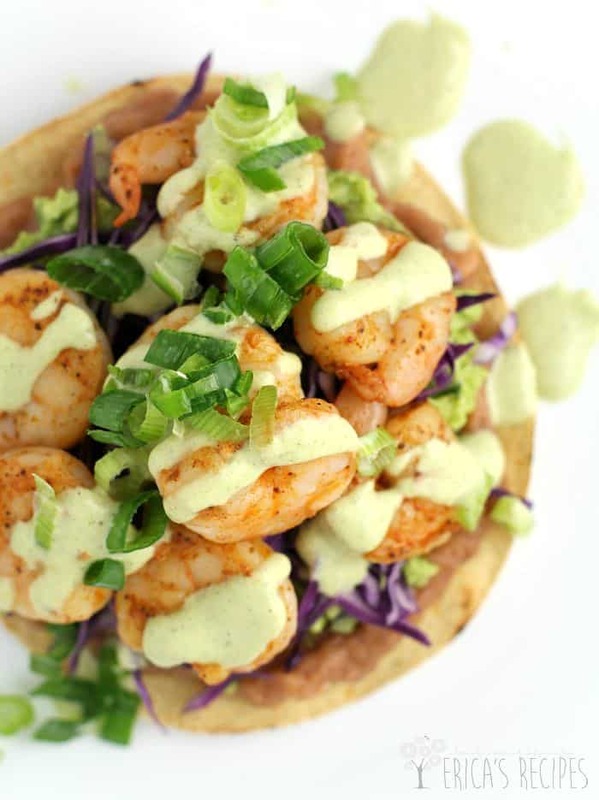 Top with red cabbage, 5-6 shrimp, a drizzle of Roast Poblano Sauce, and a sprinkling of green onion. Serve immediately. Yields 4 servings. 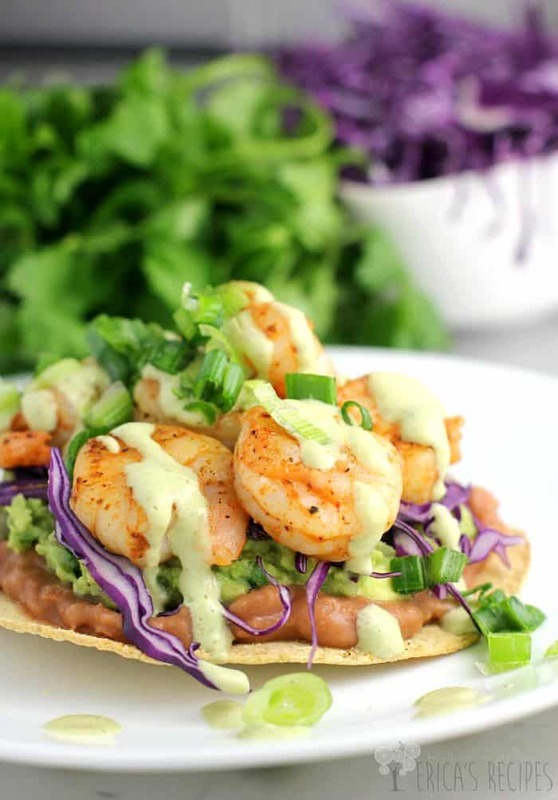 I’m loving everything about this healthy shrimp dish, it sounds so full of flavor and delicious, and the roast poblano sauce is the perfect topping! This really is a ‘fun food’ recipe!! LOVE IT! These look delicious. I’ll often make bean and guacamole tostadas when we need a quick meal. I pinned this to make every soon. Oh, love your poblano sauce and the extra dose of protein with the beans! Delicious chalupas! 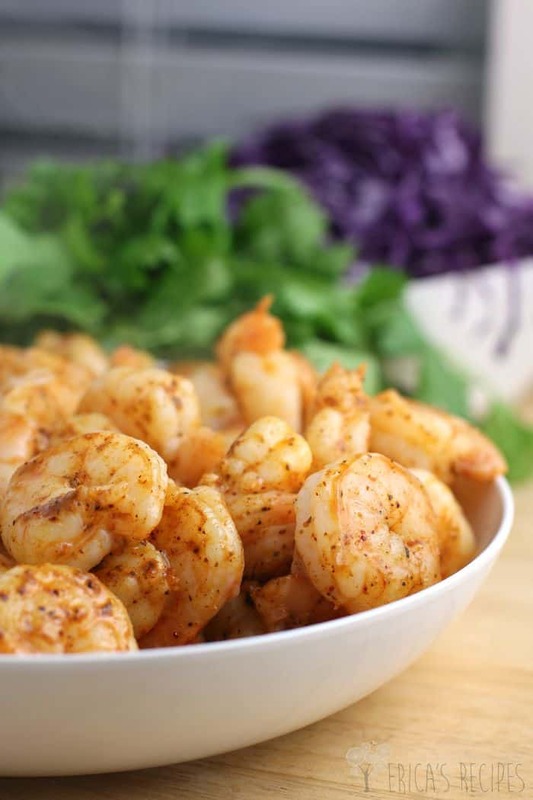 We all love shrimps in this house and this is a dish i am sure would please everyone around here! Oh my goodness that sauce with the roasted poblanos! I want to put it on everything! 🙂 This looks so fresh & delicious. What a great combo of textures and flavors. Yummy!! I love how you healthified Mexican food! That makes me so hungry! What a yummy recipe. This sounds like something my husband would love! Thanks for sharing. Oh it’s so pretty w/ all those bright colors – I need to incorporate shrimp into my meals more often! Looks delicious and healthy! I can’t wait to make it. Thanks for sharing. Oh yum Erica. I love the sound of this. Great photos! I am absolutely drooling over here!! This is one fantastic bright and flavorful recipe!!! 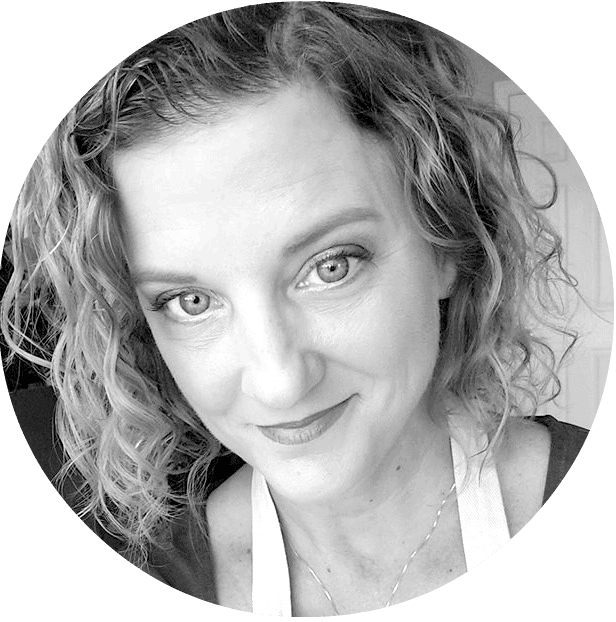 What a beautiful dish Erica…and your photos are absolutely stunning! 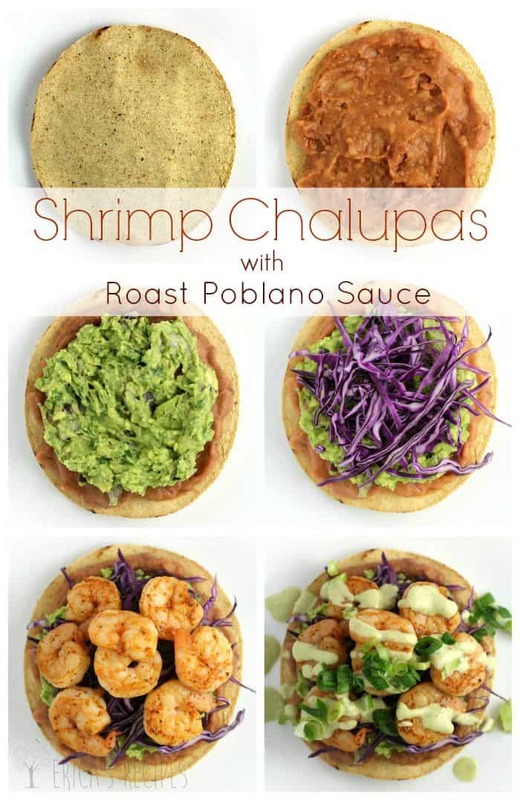 Your Shrimp Chalupas with Roast Poblano Sauce look so fresh and delicious! And I agree with Linda, what beautiful photographs!